Karina's Kreations: Starburst Sayings Pop'n Cuts Card! Starburst Sayings Pop'n Cuts Card! I run a stamp set of the month club once a month and the stamp set this month is Starburst Sayings. I love the stamp set and the matching Framelits. It's so easy to create cute cards with this stamp set. The label pop'n cuts is on sale until Tuesday for $20.21 and I used it to create this fun card which is a stamp set of the month card. For $30.95 you get the Starburst Sayings clear mount stamp set and three hand stamped cards. You can get the card kits too if you want to complete the cards at home. Email me at kchin2@telus.net if you want to join this month. 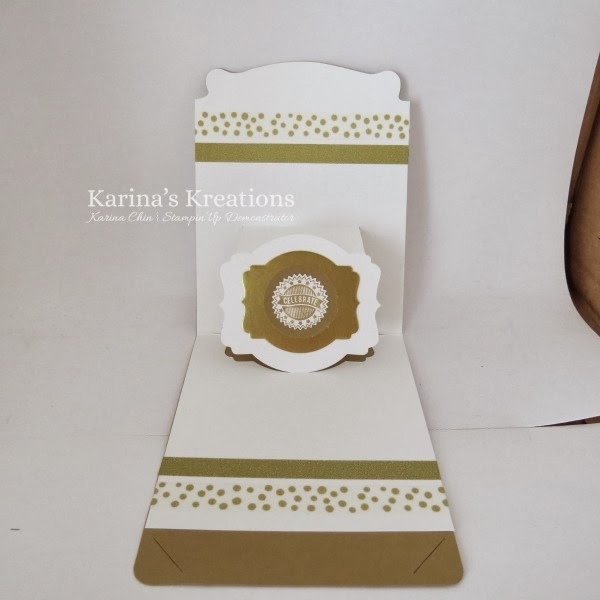 -Whisper White & Baked Brown Sugar Card Stock. I made a video with a few quick tips for this die however there was too much light and some of the video is hard to see. So Sorry!! !